A great new product to join our range of cash handling equipment. 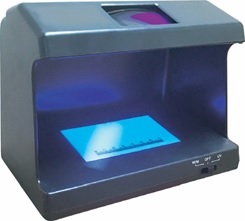 Ultraviolet banknote detector is a simple and effective equipment to identify counterfeit banknotes. It equipped with multiple counterfeit detections, such as IJV-light, white light, magnifier and size scale. Multiple detectors are the best way to avoid counterfeit notes!